The first Apostle. Fisherman by trade. Brother of Simon Peter. Follower of John the Baptist. Andrew went through life leading people to Jesus, both before and after the Crucifixion. Missionary in Asia Minor and Greece, and possibly areas in modern Russia and Poland. Martyred on an saltire (x-shaped) cross, he is said to have preached for two days from it. 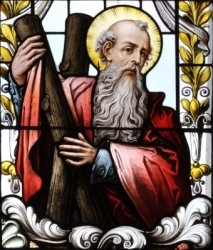 Some peculiar marriage-related superstitions have attached themselves to Saint Andrew's feast day. • An old German tradition says that single women who wish to marry should ask for Saint Andrew's help on the eve of his feast, then sleep naked that night; they will see their future husbands in their dreams. • Another says that young women should note the location of barking dogs on Saint Andrew's Eve: their future husbands will come from that direction. • On the day after Andrew's feast, young people float cups in a tub; if a boy's and a girl's cup drift together and are intercepted by a cup inscribed "priest", it indicates marriage. There are several explanations for why Andrew became the patron of Scotland. • In 345, Emperor Constantine the Great decided to translate Andrew's bones from Patras, Greece to Constantinople. Saint Regulus of Scotland was instructed by an angel to take many of these relics to the far northwest. He was eventally told to stop on the Fife coast of Scotland, where he founded the settlement of Saint Andrew. • In the 7th century, Saint Wilfrid of York brought some of the saint's relics with him after a pilgrimage to Rome, Italy. The Scots king, Angus MacFergus, installed them at Saint Andrew's to enhance the prestige of the new diocese. • When the Pictish King Angus faced a large invading army, he prayed for guidance. A white cloud in the form of a saltire cross floated across the blue sky above him. Angus won a decisive victory, and decreed that Andrew would be the patron saint of his country. Following Robert Bruce's victory at the Battle of Bannockburn in 1314, the Declaration of Arbroath officially named Saint Andrew the patron saint of Scotland. The Saltire became the national flag of Scotland in 1385. Studied at the University of Paris. Doctor of civil and canon law. Taught law at Paris and Vercelli, Italy. Helped found a university in Vercelli. Dominican Friar, joining in Vercelli, and receiving the habit from Blessed Jordan of Saxony, whose preaching had brought him to the Order. Transferred to Bologna, Italy to study the history and theology of the Order and for the priesthood. Ordained in 1229. Noted preacher in Bologna. John returned to Vercelli in 1232 to establish a Dominican priory, and to serve as its superior. Peacemaker between Venice and other Papal States. Prior of the Dominican house in Bologna, and spiritual director to its nuns. Dominican Provincial of Lombardy in 1257. Fought heresies in northern Italy. Friend of King Saint Louis IX, and often consulted Saint Thomas Aquinas on theological matters. Master-general of the Dominicans from 1264 to 1283. Insured uniform liturgical celebration throughout the Order. Served at the papal court of Pope Clement IV. Considered for the papacy after the death of Clement; when he learned of this, he fled the city. Pope Gregory X was elected instead. Papal legate. Peacemaker between Venice and Genoa. Peacemaker between France and Castile. Commissioned by the pope to draw up the schema for the Second Council of Lyons, and actively participated in the Council. In 1274 he founded what eventually became the Holy Name Society (Confraternity of the Most Holy Name of God and Jesus). Appointed archbishop of Jerusalem in 1278, but begged to be released from the responsibility, citing advanced age, ill health, and the need for strong, vital leadership in the war-ravaged region. Tradition says that during the translation of the relics of Saint Dominic de Guzman 1267, when the body was exposed to view, the head was seen to turn towards Blessed John. Embarrassed, John moved to another part of the church, giving his place to a cardinal. The head of Saint Dominic was seen by all to turn again toward John. Married to Saint Irene of Rome. Military officer in the imperial palace in Rome during the reign of Emperor Diocletian. A quiet Christian, he was denounced to authorities for sheltering fellow Christians; arrested, tortured and martyred. Born to the nobility, the youngest son of Wolfram of family of the counts of Stahleck in modern Germany. Page in the court at Heidelberg, Germany. In his early teens, Everard felt a call to religious life and tried three times to enter the Cistercian abbey of Schönau near Heidelberg, but was refused as being too young and uneducated. At age 16 he built himself a hermitage at Chumbd, Simmern, Hunsrück, diocese of Mainz, Germany and retired there from the world. Helped found a convent of Cistercian nuns at Chumbd (Comeda; Kumbd), Germany in 1183. Cistercian monk. Sub-deacon. Spiritual director of the nuns of Chumbd. Two of his sisters became nuns there, and a brother joined the Cistercians as a lay brother. Raised a Protestant by his uncle, a schimastic priest. Ordained as a Anglican minister at age 19. Friend of Saint Edmund Campion. He converted to Catholicism in 1570 while a student at Saint John's College, Oxford. Studied and ordained at Douai, France, the first Englishman trained there. Ordained and returned to England in 1575 with Saint John Payne to minister to covert Catholics in Cornwall. Arrested in 1576, condemned and martyred for the crime of being a priest. Proto-martyr of English seminaries. Born to a poor family. Skilled carpenter. Member of the Order of Hermits of Saint Augustine. Noted for his obedience to the Rule of his Order, his piety, the fervor of his prayer life and devotion to Eucharistic Adoration. Galgano led a worldly life in his youth, but converted and became a hermit on Monte Siepe in Tuscany, Italy. A church built on the site of his hermitage in 1196 was turned over to the Cistercians in 1201, and they claimed Galgano as one of their own. Legend says his conversion was caused by a visit from the Archangel Michael. After the vision he said giving up his former lifestyle would be as easy as cutting rocks with a sword. To emphasize this sarcastic remark, he drew his weapon and thrust at a stone, expecting the blade to snap; the sword buried into the rock up to the hilt, and Galganus changed his life. Seminarian in Orsan in 1821. Priest. Studied at the Paris Society of Foreign Missions. 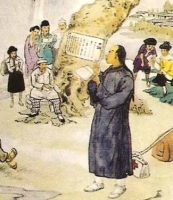 Missionary to Annam, Vietnam in 1830. In 1832 he was offered the position of head of the Foreign Mission Seminary in Paris, but declined to continue his work in the field. Transferred to the province of Binh-Thuean. In 1833 a royal decree ordered the arrest of all European missionaries. Father Joseph was arrested and imprisoned in Saigon for 18 months. He was caged, tortured, mutilated and finally murdered. Martyr. Ordained in 1927 in the archdiocese of Czestochowa, Poland. Religion teacher. Director of the episcopal Latin school in Wielun, Poland. Priest in the parish of Saint Thecla in Raczyn, Poland. Youth minister and catechist. One of many priests arrested together in the area of Wielun on 6 October 1941. Imprisoned, deported, tortured and finally martyred in the Nazi persecutions of World War II. Son of King Hoel I and Saint Koupaïa; cousin of King Deroc of Dumnonia. Monk in Wales. Friend and co-worker with Saint Briarch. Evangelized in Brittany. Founded the monastery of Lan Pabu at Leon, Spain. Bishop of Tréguier (Treher), Brittany. Advisor to King Childebert I. Several sites in the Leyn Peninsula of Wales bear his name. Priest, ordained at age 35, he spent his ministry walking from village to village, ministering to Christians and spreading the faith. Arrested on Pentecost 1821, he was tortured and then imprisoned for two years before his sentence was finally handed down. Martyr. Early 13th-century priest at Saint Peter's Church, Slagalse, Denmark. While on pilgrimage in the Holy Lands he received a vision of a man on a white horse who miraculously transported him home so that he could celebrate Easter with his parishioners. The rider then transported him to shrine of Santiago de Campostella in Spain, and then to the shrine of Saint Olaf in Norway. 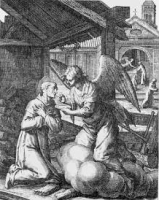 Upon his return to Slagalse, Anders was able to heal the lame and blind by prayer. Benedictine monk at Saint Bertin Abbey, diocese of Arras, France. Renowned for his devotion to Our Lady. Cobbler. Priest in the apostolic vicariate of England. Martyred in the persecutions of Queen Elizabeth I.
Bishop of Beth-Seleucia, he was known for the number of converts he brought to the faith. Denounced for interfering with the Persian star worship, and suspected of treasonous collaboration with Roman authorities, he was arrested in 339. Tried before King Shapur II, they were given the chance to save themselves by denouncing their faith; they declined. Martyr. Bishop of Beth-Nictor, he was known for the number of converts he brought to the faith. Denounced for interfering with the Persian star worship, and suspected of treasonous collaboration with Roman authorities, he was arrested in 339. Tried before King Shapur II, they were given the chance to save themselves by denouncing their faith; they declined. Martyr. Brother of Saint Tarbula. Convert. Denounced for suspected treasonous collaboration with Roman authorities and Christianity in general, he was arrested in 339. Tried before King Shapur II, they were given the chance to save themselves by denouncing their faith; they declined. Martyr. Convert. Denounced for suspected treasonous collaboration with Roman authorities and Christianity in general, he was arrested in 339. Tried before King Shapur II, they were given the chance to save themselves by denouncing their faith; they declined. Martyr. Convert. Denounced for suspected treasonous collaboration with Roman authorities and Christianity in general, he was arrested in 339. Tried before King Shapur II, he was given the chance to save himself by denouncing his faith; he declined. Martyr. Augustinian canon regular at the Holy Sepulchre in Jerusalem. Travelled to Europe to collect funds for the Eastern houses of his order. Had a great reputation for personal holiness. Daughter of an Irish chieftain. Nun. Friend of Saint Canice of Aghaboe. Virgin martyr. No details of her life have survived. An island in the Ionian Sea is named for her. Devotion was widespread in the East. Julian the Apostate unsuccessfully tried to suppress devotion to her. Archbishop of Milan, Italy. Writer. Attended the Council of Rome in 313. One of the originators of the Ambrosian liturgy and chant. His life and works were praised by Saint Ambrose of Milan. His father was Jewish, his mother was Arabic, and Trojan was an adult convert to Christianity. Priest. Student of Saint Vivien. Beloved bishop of Saintes, France. Benedictine monk at San Niccolo dell' Arena. Abbot at Maniaco, assigned to restore discipline. Hermit at Palestine. Miracle worker. Benedictine monk at Saint-Nicaise Abbey, Rheims, France. Abbot of Gemblours Abbey in Belgium. Priest in Rome, Italy. Opposed Pelagianism, and murdered by its adherents. Missionaries who worked with Saint Willehad of Bremen. Martyrs. - Attroban, Benjamin, Emmingen, Folkard, Gerwald and Grisold.